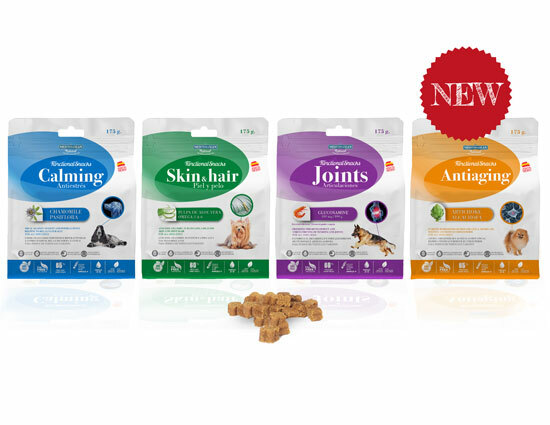 Mediterranean natural | Web of Mediterranean Natural (Pet Snack Company, S.L. 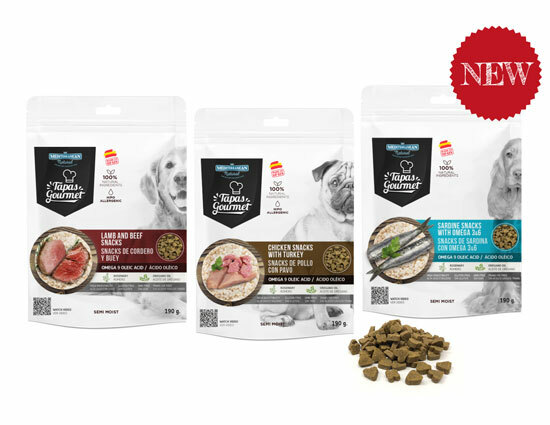 ), Spanish company dedicated to the manufacture, commercialization and distribution of food and semi-moist treats for dogs and cats. Made with fresh meat and fish cooked at low temperature, they provide all the nutrients of the raw material and are the ideal food supplement for your cat. They are gluten free, artificial colourants free, GMO free, trans fatty acids free. The “Tapas Gourmet” of MEDITERRANEAN NATURAL are a 100% natural snack made with fresh meat and fish of the highest quality. They contain oregano oil and rosemary, natural antioxidants that they improve digestion (stimulating bile) and prevent bacterial infections, helping the correct gastrointestinal transit. They are gluten free, artificial colourants free, GMO free, trans fatty acids free, and are a natural source of Omega 9. The two flavours of meat are hypoallergenic, sardine is rich in Omega and3 6. Joints and Antiaging. Made with fresh meat and fresh fish. 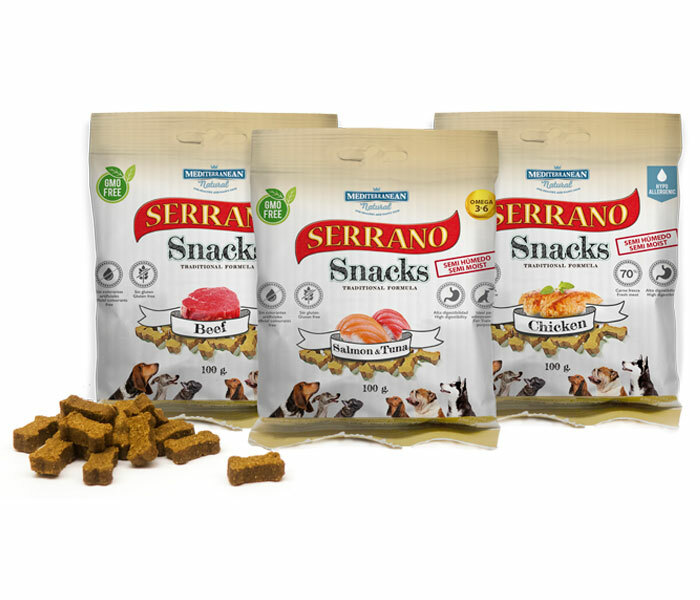 MEDITERRANEAN NATURAL Serrano Snacks, delicately cut into small bone shape pieces, guarantee your pet’s safety, whilst maintaining all their nutrients, reflecting a natural diet and containing 70 % fresh meat (60% in “Serrano Snacks for puppies”). They are gluten free, artificial colourants free, GMO free and trans fatty acids free. They are a hypoallergenic product (except “salmon and tuna” and “for puppies” flavours) natural source of oleic acid. The Serrano Snacks of salmon and tuna contribute Omega 3 and 6. 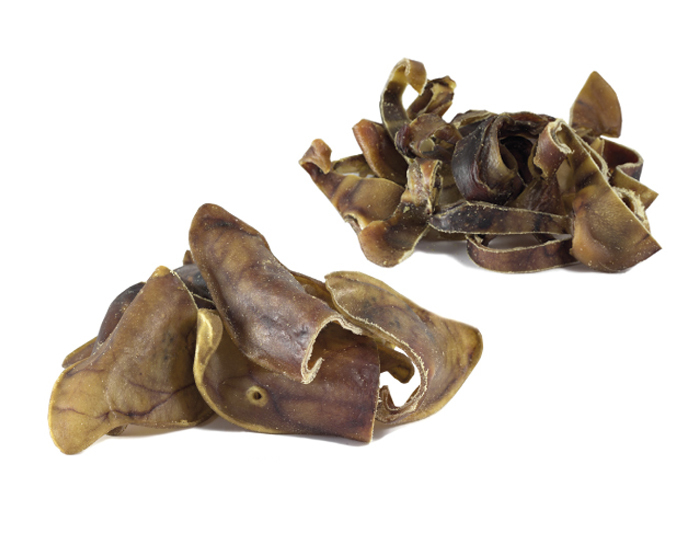 They are the perfect snack to reward your pet’s good behaviour. All bags are airtight seal to preserve nutrients in good conditions. 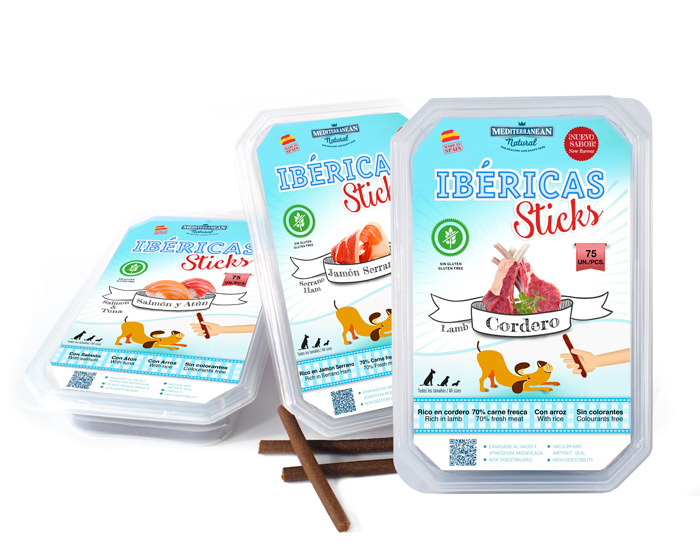 Delicius Premium sticks for dogs with a high fresh meat content as well as fresh fish, they are individually vacuum sealed to be fresh all time till it is consumed. La Barrita of MEDITERRANEAN NATURAL is a hypoallergenic product (except the“salmon and tuna” flavour). They are gluten free, artificial colourants free, GMO free, trans fatty acids free, and are a natural source of Omega 3 and 6 and oleic acid. We introduce 4 different flavours in packs of 12 individual sticks. It is the perfect treat to go walking with your dog as well as it is a perfect complementary food due to the high biological proteins value. Delicious Premium Sticks made with 70% fresh meat (60% in “for puppies sticks”) vacuum and airtight seal to perfectly preserve flavours and aromas. due to their vitamin and mineral content. They are gluten free, artificial colourants free, GMO free and trans fatty acids free snack. They are a hypoallergenic product (except the “salmon and tuna” and “for puppies” flavours) and natural source of oleic acid. Ibéricas Sticks of salmon and tuna provide Omega 3 and 6.
your pet’s teeth whilst removing tartar. 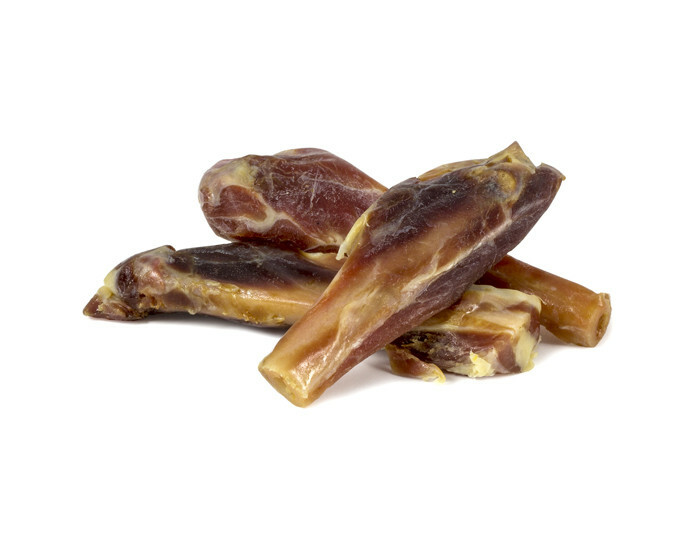 MEDITERRANEAN NATURAL Serrano Ham Bones are not boiled, but are subjected to a natural drying process in order to preserve all nutritional properties and prevent them from splintering so easily when chewed or digested by your pet. They are the ideal snack to strengthen the gums and clean the plaque of the dog’s teeth. It is a product hypoallergenic and 100% natural that does not contain gluten and not trans fatty acids. In addition, it is an excellent source of protein. with difficulties eating dry food. 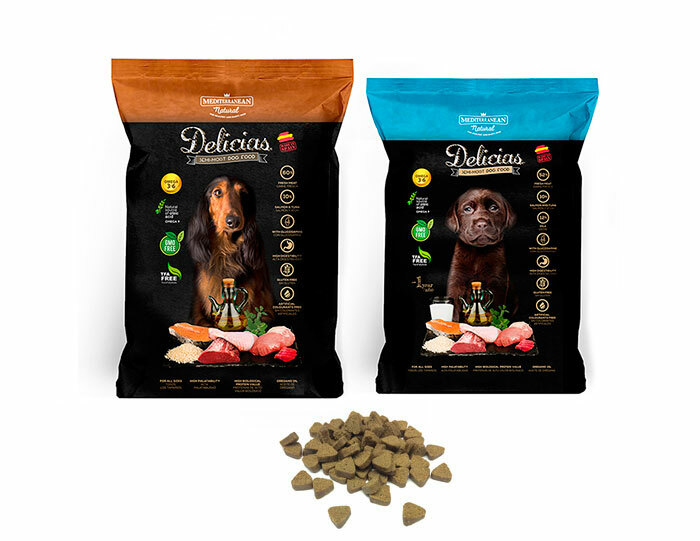 Airtight seal, Delicias semi-moist dog food contain crab extract and prawn extract (source of glucosamine) to promote the development of cartilaginous tissues. They are gluten free, artificial colourants free, GMO free, trans fatty acids free, and are a natural source of oleic acid (Omega 9). Rich in Omega 3 and 6.